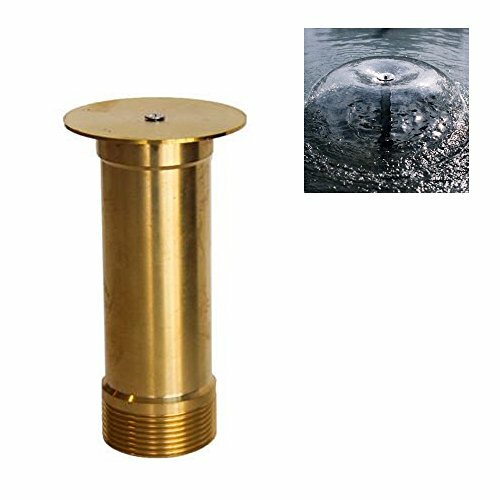 NAVA New 1/2” DN15 Interior 3/4” DN20 Exterior Thread Mushroom Fountain Nozzle Spray Head Pond | Fountain City Art Ctr. The Bell / Mushroom Nozzle is a popular effect used in commercial and architectural fountains. Your own water dancing show! - Fountain nozzle sprays can be used in a wide variety of ways to achieve spectacular effects. Easy installation - It only requires tubing and a submersible water pump. The performance of all fountain spray heads is directly affected by the GHP pumped through the fountain nozzle head. For a higher and wider spray pattern in your pond, a higher GPH pump is required. Bell or so called Mushroom nozzle creates a clear water bell pattern in the adjustable shape. It is the least noise and splash fountain effect. The relaxing sound of splashing water is particularly effective in silence wind-free locations like the water garden, indoor reception hall, or outdoor pool that are protected from the wind. Bell nozzles are water level independent and can be located in dry areas. 100% MONEY BACK GUARANTEE- NAVAdeal are backed by 100% guarantee that you are fully satisfied with your product or receive your money back. If you have any questions about this product by NAVADEAL, contact us by completing and submitting the form below. If you are looking for a specif part number, please include it with your message.